May is around the corner, and with it comes the fifth edition of the Collective Design fair, occurring May 3 through May 7 as part of NYCxDESIGN. The event will be at The High Line’s former southernmost terminal, Skylight Clarkson Sq, a “horizontal skyscraper” spanning three city blocks in West SoHo. As if the venue wasn’t interesting enough, Collective Design has now announced several installations to christen the space. 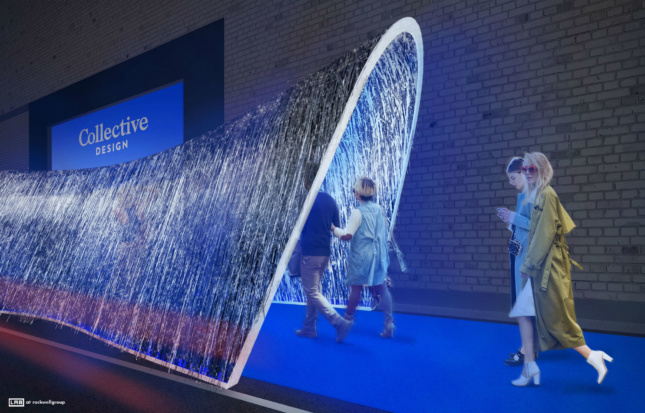 Following in the footsteps of last year’s Glacial Drift by Brooklyn-based The Principals, The LAB at Rockwell Group has designed a 40-foot-long “blue carpet” that passes through a glittering tunnel as the fair’s entrance. The in-house design innovation studio found inspiration for the experience in the red carpets of Hollywood and their choreography and their promises of excitement. The tunnel will be fabricated by Brooklyn-based The Factory NYC, built from plywood ribs cut on a CNC router. The structure will then be clad entirely in mylar foil fringe, which will give the tunnel its glamorous shimmer. The passage will also expand and contract, giving it the illusion that it is breathing and adding a touch of other-worldliness to the grand entrance. 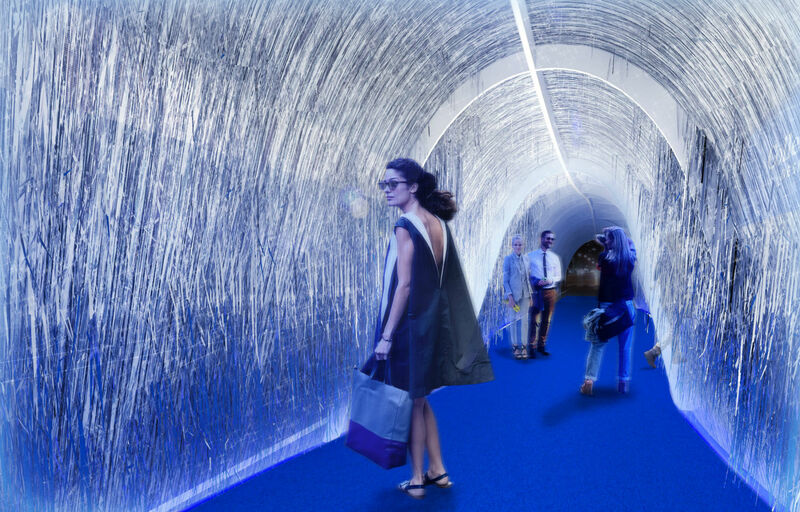 After traipsing through the breathing blue tunnel, visitors will experience another kind of living corridor: an indoor classical garden designed by Brook Klausing of Brook Landscape. The installation will feature raw timbers from the Rockaway Boardwalk, salvaged in the aftermath of Hurricane Sandy, and select pieces from Natural Workshop, a collaboration of Klausing and Brian Green, who is launching a new product line this spring. Other installations include The Noguchi Museum’s Waiting Room: Noguchi/Stadler, an exhibition of Isamu Noguchi’s work alongside designer Robert Stadler, which mimics the strangeness of waiting spaces and “public and private forms of standing-by.” Huniford Design Studio, led by James Huniford, will be furnishing the VIP Lounge for the fair, showcasing furniture from the Huniford Collection, a luxury furniture line from the designer launching this spring. Also making an appearance is Stickbulb, a handmade lighting brand that utilizes sustainably sourced and reclaimed wood. They will be installing a limited-edition piece made from reclaimed redwood planks salvaged during the demolition of New York City water towers. Alongside the announcements of these exciting installations, Collective Design also announced the addition of several major partners for 2017: The Museum of Arts and Design, Cooper Hewitt, Smithsonian Design Museum, Storefront for Art and Architecture, Open House New York, The Architectural League of New York, Royal Academy of Art (RCA) in London, New York School of Interior Design (NYSID), School of Visual Art (SVA), and Bard Graduate Center (BCG). With the announcement of these installations and additions to the fair, May is shaping up to be an inspiring and exciting month for the New York City design community. You can find more information about the Collective Design fair here and more information regarding NYCxDESIGN’s many festivities here.